1. Unpack all components. You should have two end verticals and 1 stretcher. 2. Place one vertical face side down on a clean flat surface. Turn stretcher so that you can insert a bolt with washer through the hole in the bottom of the stretcher. 3. Insert the bolt into the hole on the vertical, making sure the hole in the stretcher is facing toward the bottom foot of the vertical. Finger tighten. Repeat for opposite side. 4. Once both end verticals are loosely attached, tighten the bolts completely. 5. 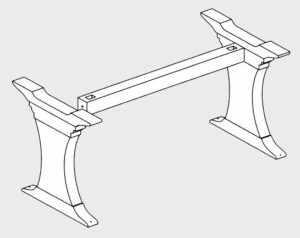 Attach the assembled base to your table using screws provided in hardware pack. 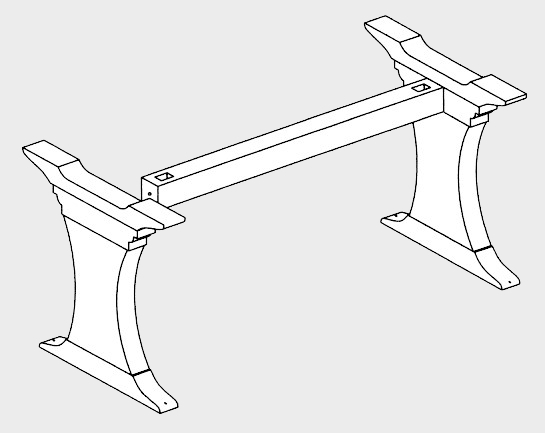 The base attaches to the table cleats or slide, dependent upon table type.